When a person writes a review, the first thing they have to do is think about what they want to say about the book and what is worth mentioning. After reading a few reviews on this book, I'm thinking that my idea of prioritizing must be completely different from everyone else's. Somewhat frustrating love triangle...blah, blah, blah.A few similarities to Dark Swan...blah, blah, blah.Heroine who really should have known better about a few things...blah, blah, blah.Great action for a first book...blah, blah, blah.No cliffhanger ending...blah, blah, blah.Mischievous hitchhiking pet which is a mix of a cat and a ferret...blah, blah...WHAT?! ?Why did no one tell me about the kimki? Where are your priorities, people!?! *edit to add that Wendy Darling did in fact mention the Kimki but I missed it*Okay, so maybe this was more important to me than it was to all the other people who actually cared about the story. Silly people. Did no one else have a love for the cheesy 80's movie, Beastmaster? You know, the one where the little ferrets would follow their master around? I can not tell you how much I wanted creatures to come to me whenever I called after watching this movie.If ferrets aren't your thing, then how about a falcon?Either way, creatures at your beck and call = game winner.Although, I'm pretty sure that I pictured Aren from the book to be much more attractive than the beastmaster guy. 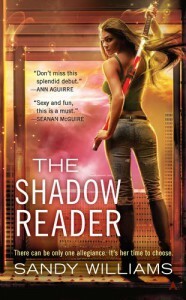 And since I've already mentioned one of the men in Shadow Reader, I will now go back up to the top of my original list.Somewhat frustrating love triangle : It was. Up until the end of the book, I was not a fan. I don't like how we were made to believe that the love McKenzie had for Kyol was super strong, yet she immediately started having feelings for another man (played off as chaos lusters and Stockholm Syndrome). The point could be made that maybe the original love was based more on familiarity and dependency, so there was a reason she might gravitate toward another person, but I still felt like the love triangle could have built slower. However...the way the ending of the first book was handled without a cliffhanger made me pleased with the way things turned out. For those who are not fans of love triangles and don't mind a small spoiler, click this because it might make you feel better about trying the book : She chooses one man by the end of the book and her decision is solid. The love triangle has been officially deactivated from what we can see. Because of this development and the way the book ended, my rating jumped up from a 3 to a solid 4.A few similarities to Dark Swan : I saw more than a few in the first 5 chapters (enough to have me worried) but thankfully, the rest of the story felt unique enough to stand on its own. Crisis averted!Heroine who really should have known better about a few things : The fact that this woman failed to learn much about the details of her job, then kept flip-flopping about who she wanted to trust or believe was a point that bothered me. Again, thankfully, the way the book turned out hopefully nipped a good portion of this in the bud. Another possible crisis averted!Great action for a first book : There were equal parts world building and story/action, which was NICE for a first-in-a-series UF. To say that this is rare would be an understatement.No cliffhanger ending : This is another rarity in UF (heck, series in general) these days. You know what's probably coming down the road and know that the battle has just begun, but at least the book ended on a note where you weren't waiting to figure something out.Other than my initial feelings about the love triangle, as well my confusion over the few "flashbacks without warning," I enjoyed the read. In case you're curious about the world and how it functions, let's give a super fast breakdown :McKenzie is a shadow reader, which means she's a human with abilities that are useful to the Fey. Among her gifts are the ability to see the fey, as well as her ability to map the shadows which Fey travel through. In essence, her job is one of a hired tracker. She's working for the "court" Fey who are opposed by an offshoot group of rebels. In a time of war, her skills are invaluable, so she is in high demand - from both sides of the war.Captured by one of the leaders of the rebellion, McKenzie finds herself bombarded with new information, questioning everything she previously thought was truth. Aren, her captor, is probably my favorite character as of right now. His banter with McKenzie was one of the highlights of the book. I loved that he called her "my nalkin-shom. "Contact between the Fey and humans produced an effect called edarratae, which are likened to sparks of electricity. This absolutely takes personal chemistry to another level.How would you not love Aren? "I could heal you with a kiss." Mischief sparks in his silver eyes.He swipes it out of the way and storms forward. "He's had ten years to make you fall in love with him! I haven't had ten weeks! Tell me how that's fair! ""Fine," he says, his words coming out breathless. "I'll save your precious sword-master, McKenzie. But I will never, ever give you back to him."Yes. Me likey.